Amerigo left his homeland of Sardinia Italy at age 18. He took his heritage with him cooking his way through France, Germany and Luxemburg before he landed in London, England in the 1960s. After working for years in Quebec, Amerigo decided to move to Vancouver. Then seventeen years ago, his wife and son packed up again to be closer to his wife’s family who lived in Westbank BC. Amerigo’s three decades of cooking experience is evident in his mouth watering dishes of tortellini, fettuccine, lasagne and routine, his authentic pastas imported from Italy. He takes pride in his homemade sausage and desserts, in which cheesecakes are a favourite. Today, Amerigo’s Italian Restaurant menu offers the tradition meals that were taught to him by his Grandmother on the island of Sardinia, Italy. 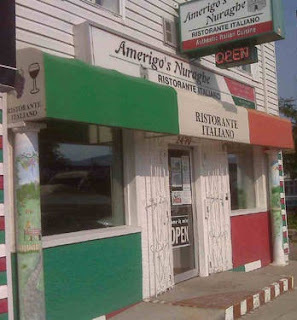 With fond memories Amerigo re-creates his grandmother recipes with homemade sauces and ingredients made from a well stocked yet simple kitchen in West Kelowna. From tradition Italian meals to meals served by his grandmother Amerigo creates succulent dishes rich in the community’s favourite ingredients from veal to lamb to artichokes.